Slovenia’s Ilka Stuhec reacts in the finish area after the women’s downhill race on Sunday at the alpine ski World Championships in Are, Sweden. 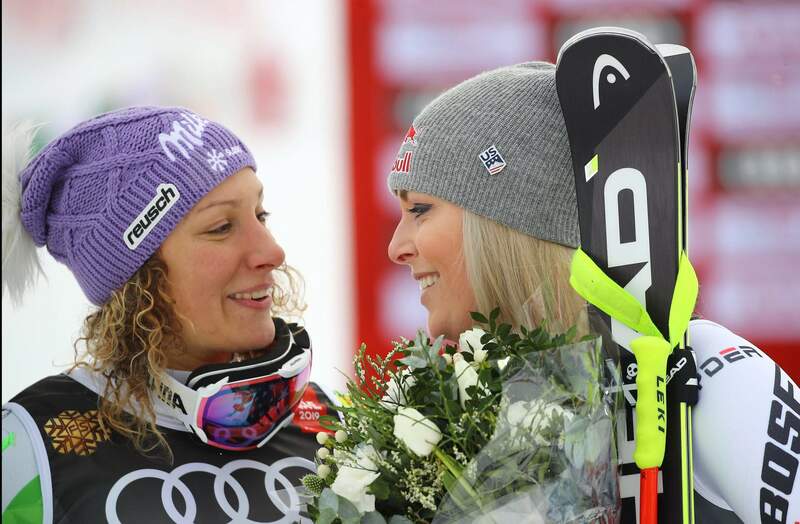 Slovenia’s Ilka Stuhec, left, winner of the women’s downhill race, talks with third placed United States’ Lindsey Vonn on Sunday at the alpine ski World Championships in Are, Sweden. ARE, Sweden – The Lindsey Vonn circus had rolled back into town, and that suited Ilka Stuhec just fine. All the talk at the world championships on Sunday – and indeed for the last few days – was whether Vonn could mark the last race of her career with a victory in the downhill. The spotlight, as ever, was almost totally on the American. But this was also a day to savor for Stuhec, who – like Vonn – has proved capable of bouncing back from serious injury. That proved to be the case, although the presence of six men dressed as kurents – 8-foot mythical Slovenian beasts wearing coats of nine shorn sheep with bells stitched on – was a sign of Stuhec’s presence in Are.